The RT Monopol Hotel is a stately hotel situated close to the quaint Old Town quarter of Krakow in Poland close to cosy bars and restaurants as well as popular shopping districts and surrounded by a rich variety of Poland's classic architecture that includes Renaissance, Baroque and Gothic buildings. The 3 Star RT Monopol Hotel is a luxurious starting point for exploring this magnificent city offering 75 comfortable guestrooms, delicious buffet breakfast and smiling traditional hospitality. 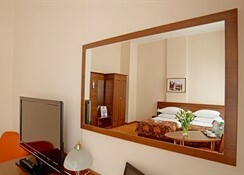 Hotel RT Monopol is within walking distance of most of the city's attractions like the Florian Gate, central Market square, and the main railway and bus station. 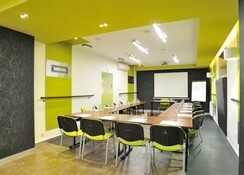 Cracow Balice Airport is 11 km from the Hotel. 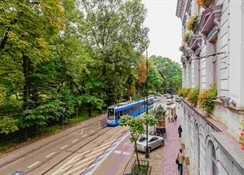 Local Tips: The Hotel RT Monopol is in a perfect position for visits to the Barbican, Royal Road with The Town Hall Tower, Sukiennice Cloth Hall, Auschwitz, St. Mary's Church and Wawel Hill. Please note a city tax of 0.50 Euros per person per night is required and to be paid locally. 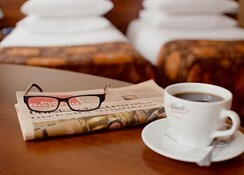 Food, drink and entertainment: Bed and Breakfast accommodation. The RT Monopol Hotel has a delightful breakfast, and the Restaurant Leo serves a varied menu of European and local specialties with sumptuous desserts. The Bar has an inviting and cosy atmosphere along with a wide selection of drinks and cocktails. The RT Monopol hosts a Dance Party every Friday night. 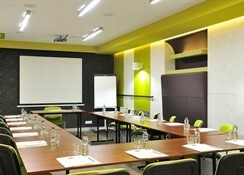 Additional: 24 hour reception, concierge desk, multilingual staff, laundry facilities (surcharge), safe deposit box for hire, wireless and wired high-speed Internet access is available in public areas, airport shuttle (with charge available 24 hours), conference centre, meeting/conference room, wedding services, event catering, parking area for 50 cars. The RT Monopol Hotel features 75 elegant and modern double rooms all with private bathroom, hair dryer on request, clock radio, desk, window that opens, direct dial telephone, Satellite TV, wired and wireless high speed Internet access, iron and ironing board on request, wake-up call service, and housekeeping. Rooms are non-smoking.